I just love my ring, it surpassed what I had expected and I am really very happy with it. The quality is great, as well as the design. it's a great fidget tool. I have wanted a ring like this for many years. Thank-you for making it available and within my means (price-wise). 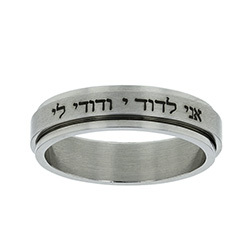 "FORGIVEN" engraved on the inside is so meaningful. Just fabulous. I am so pleased. If you look for a reminder to remain pure til marriage or that you belong to God and He to you, seek no further. Only be sure you have the right size of your finger tested out first. The ring looks great and fits well! I've worn it for about two weeks and it is comfortable with no 'rust' or skin reaction to nickel that you get from low quality stainless steel jewelry. It arrived on time and engraved as requested. Good quality for the price. My son was pleased with it. Would have liked to had a better selection of guys rings and he needed a half size so I ordered up and it is too big. So now, he either has to wear it with a bulky, uncomfortable ring guard or not wear it at all, which defeats it's purpose.